The superb May weather looked set to continue as we all gathered at Evanton for the Whit Bank holiday weekend. Kenny and I arrived on the Thursday night and took the opportunity for a day trip to Reiff for some sea cliff climbing. With a North East wind Kenny predicted it would be "idyllic". Not quite and only two other hardy souls braved the cold buffeting winds. 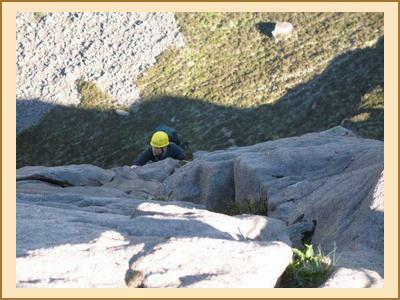 The return route gave Kenny a chance to make a food drop at Inverlael for his planned back pack the following week. I was glad that others were equally confused that he was dropping off a "tin". "Don't you want to drop off a bit more food than that?" It turned out that the "tin" was an extremely large biscuit tin filled with all sorts of goodies. More sunshine was promised on Saturday. Kate, Penny and Harry headed off for a big day on the Deargs. 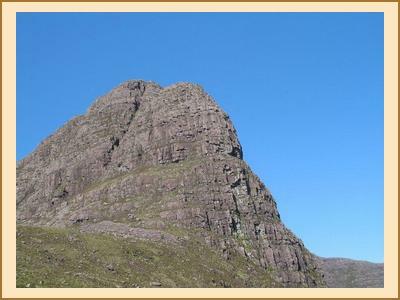 Kenny, Alan and I headed off to Applecross for the Classic Cioch nose, first climbed in 1960 by Bonington and Patey. With memories of the second chimney pitch still fresh in his mind from doing the route 8 years ago, Kenny kindly offered Alan the lead. After a good traditional struggle, involving judicious use of both knees and the drawing of blood, this allowed us to enjoy a rare moment - Alan getting out of breath. It turned out to be quite a long day and by the time we had completed the climb and the remainder of the ridge, hopes of getting a lift back down the Bealach na Ba were fading. The road was getting quieter and quieter and only one car remained in the car park. As luck would have it the last car went past just as I got to the road. The only problem was that Kenny and Alan (with car key) were still coming down the hill. I did feel a tad guilty when I pointed to the two figures in the distance and asked if it would be OK if he waited and took them down as well. Meanwhile on the other side of Scotland the rest of the EMC (Alison W, Gillian, Fiona and Anne C were doing a Corbett/Graham combination down Glen Calvie . This proved to be a very nice Glen with some upmarket double glazed tree houses, gates that opened automatically and a friendly laird who expressed some concern about the ability of the girls to complete the walk. His kind offer to call Mountain Rescue after 5 hours was not taken up. Fiona borrowed my bike as part of a carefully worked through plan to enable her to get back to Evanton in time to watch the Cup final. Unfortunately for Fiona, the master plan unravelled through Kenny's penchant for thriftiness (see Jura Trip report from May 2006) - the half patch puncture repair of the night before blew off and Fiona was left to carry the bike out. Some more big days were planned on Sunday. Anne did the Deargs. Gillian and Fiona headed off to the Fannichs with a distressing moment for Gillian when she discovered that she had taken the wrong lunch box and had to make do with 4 day old steamed potatoes and a block of cheese. Alison W and Alan were doing Ben Hee and Meallan Liath Coire Mhic Dhughaill linked by a couple of Grahams. Well they were not exactly linked. As Alan commented, it would probably have been quicker to return to the car rather than connect the hills up. All in all a day that Martin would have approved of. Kenny and I did Ben Wyvis from the back - cycling up Loch Glass and following a glorious path all the way round the tops. Penny and Kate opted for a shorter day on Am Faochagach and Harry had a beach walk. This was also the day that Scotland on Sunday reported that alcohol consumption in Scotland had doubled in the last few years - not a surprise if the local pub in Evanton is anything to go by. Early in the evening, Kate was knocked off her stool by a paralytic customer. Later when energy levels got low, the preferred technique seemed to be a red bull/pint combination. The logistics around Kenny's backpack were starting to get complicated but at the last moment he changed his plans so there is still a tin of food hidden at Inverlael. On Monday we left Fiona, Gillian and Kenny staying up north. Alison W was doing some Fannichs. Penny and Kate were doing some more munro bagging at Achnasheen. Harry, Anne, Alan and I headed to Dunteltaig. A nice quiet crag in a lovely location just south of Inverness. At least it would have been quiet if a busload of school children hadn't turned up for abseiling and top roping as part of Health week at their school. After some serious jungle bashing we managed to find the multi pitch v diff which turned out to be far more pleasant than its initial appearance suggested.